In 1957 Paul Bowles wrote this article about finding and living on a tiny tropical island in the Indian Ocean—Taprobane—only one hundred yards off the coast of Weligama, near Galle, in southern Ceylon (now Sri Lanka). He first became intrigued by Taprobane island in 1949 when he saw photographs of it during a stay at Wilton House, the magnificent ancestral home of his friend from Tangier, David Herbert. The Herbert family had stayed on the island in the mid-1930s. 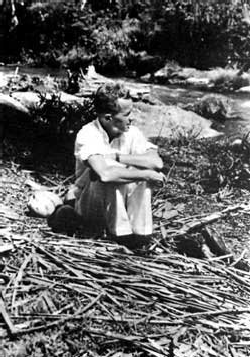 Bowles first visited Ceylon in 1950 and two years later when Taprobane was put up for sale, he bought the island with some of the proceeds from his second book The Delicate Prey and Other Stories. Paul Bowles wrote the final chapters of The Spider's House while living on Taprobane. In late December 1954, Jane Bowles, Ahmed Yacoubi and Mohammed Temsamany traveled with Paul Bowles on the SS Orsova to Colombo, eventually arriving on the island. Shortly thereafter, fellow passenger Richard Rumbold made a short visit, and several weeks later Peggy Guggenheim came for a longer stay. Jane Bowles' health declined and she had difficulty writing and living in the tropical environment, so she returned to Tangier with Temsamany while her husband remained with Yacoubi. Four years after buying Taprobane island, Paul Bowles sold it and returned to Tangier. On December 26, 2004, a completely unexpected tsunami devastated parts of Sri Lanka and other countries in South Asia—Indonesia, Thailand, India, The Andaman & Nicobar Islands, Malaysia, Bangladesh, Myanmar (formerly Burma), the Maldives and Somalia—with a final total death toll of more than 250,000 people and countless others left injured or homeless. The tsunami was the result of the most powerful earthquake in over 40 years―calculated at about 9.2 on the Richter scale―centered off the northwest coast of the island of Sumatra, Indonesia. Miraculously, Taprobane island and its octagonal house sustained only minor damage (the house is 60 feet above sea level). All fourteen of the island's guests survived without injury, including the current owner and his family. Two types of landscape have always had the power to stimulate me, the desert and the tropical forest. These two extremes of natural terrain—one with a minimum and the other with the greatest possible amount of vegetation—are both capable of sending me into a state bordering on euphoria. Unfortunately, when you have a taste for two antithetical things, you are in danger of becoming a pendulum, moving with increasing regularity back and forth between them. 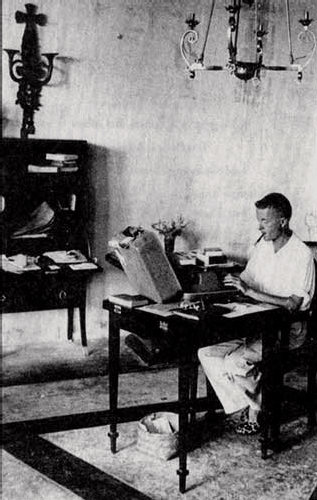 Paul Bowles on his first visit to Ceylon, 1950; two years later he bought Taprobane. I bought a house in North Africa to be near the desert. Then, after a decent interval, I found myself thinking with nostalgia of the jungle. Since the closest rain forest to Morocco lies on the further side of both the Sahara and the Sudan, I decided to look eastward for the other extreme, and hit on the idea of trying Ceylon. There would be luxuriant vegetation, and there would also be the pleasure of contact with an unfamiliar culture. Of course, as is almost always the case, the spot turned out to be something very different from what I had imagined it would be. Its flavor was far less "Oriental" than I had foreseen. Each successive European occupation—Portuguese, Dutch, English—had left deep marks on the culture, but there were enough unexpected charms to outweigh this initial disappointment. The people were unusually sympathetic and hospitable, the food was the best I had encountered in an equatorial land, the hotel service was impeccable, and, most important, the place possessed an inexhaustible supply of superb tropical scenery. I explored Ceylon and became acquainted with its magical mornings and its incomparable sunsets. Early morning, once the mist is gone, the loveliness of the land is in full focus, and color and form are clearest; as the day progresses the increased light tends to blur both. The sunsets, particularly on the coast, are vast, breathtaking productions which last only a few minutes. The months passed, I moved from place to place, continually finding each new one better than the others, but wishing there might be some spot with which I could identify myself through ownership. Paul Bowles' Taprobane island, off Weligama bay, near Galle, in southern Ceylon (now Sri Lanka) The island, its famous house and guests, including the current owner and his family, miraculously survived the tsunami which devastated areas of Sri Lanka on December 26, 2004. 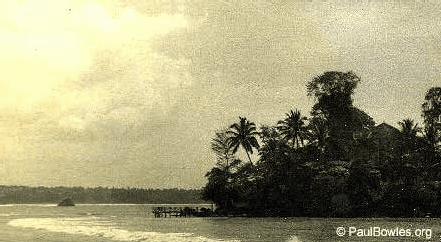 Before I had left England, I had been shown photographs of an extraordinary property off the south coast of Ceylon—a tiny dome-shaped island with a strange-looking house at its top, and, spread out along its flanks, terraces that lost themselves in the shade of giant trees. These pictures, probably more than any other one thing, provided me with the impetus to choose Ceylon rather than Thailand when I was casting about for a likely country to examine. But I returned to Europe without having caught more than a second's glimpse of the shaggy little island, from the Matara train as it rounded Weligama Bay. The memory, however, does not relinquish its images so readily; the photographs with their casuarina trees, balustrades, breaking surf and curving palm-fringed shore line remained in my head, and on my next trip to Ceylon I made a point of going to Weligama Rest House, on the shore facing the island. From here I could look straight across into the sunny verdure opposite, and I determined to explore the place. Early the first morning I put on my bathing suit and started out. The waves were blood-warm. When I climbed up onto the long boat dock ten minutes later, there was no sound but the lapping of the sea around the piles underneath. At the far end was a padlocked gate. I called out and a dog began to bark. Soon a man appeared out of the tangle of trees, naked save for a white sarong, his lips, teeth and bristling mustache brick-red with betel nut. For a rupee he agreed to show me around the little estate. It was far better even than I had expected—an embodiment of the innumerable fantasies and daydreams that had flitted through my mind since childhood. But when I got back to Colombo and made definite inquiries about the island, I learned without much surprise that the owner had no intention of selling it. Once again I returned to Europe laden with visions of the little island, but this time they had substance: the color of the filtered light on the wooded paths, the hot smell of the sun on the flowers, the sound of the sea breaking on the big rocks. More than ever the island represented an unfulfilled desire, an impossible wish. One day six months later a cable arrived at my hotel in Madrid. It read: "Owner Taprobane Willing Sell X Rupees Stop If Interested Wire Money Immediately." I was suddenly downstairs at the desk, the telegram still in my hand, cabling Ceylon. The trees, the cliffs, the strange house with its Empire furniture, were all mine. I could go there and stay whenever I felt like it. When I broke the news of the purchase to my wife, her reaction was less enthusiastic than I might have desired. "I think you're crazy!" she cried. "An island off the coast of Ceylon? How do you get there?" I explained that you took a ship through the Mediterranean and the Red Sea, crossed part of the Indian Ocean, landed at Colombo, and hopped on a train which let you off at the fishing village of Weligama. "And once you're on the island there's nothing between you and the South Pole," I added. She looked at me for a long moment. "You'll never get me there," she added. But three years later she stood on a black rock under a casuarina tree and looked out across the Indian Ocean toward the South Pole. Right at the beginning he decided he wanted not a real house with an interior, but a pavilion which would be a continuation of the landscape outside, and from every part of which there would be multiple views. And so, blithely, he did away with walls between the rooms so that all nine rooms (including the bathrooms) would in reality be only one, and that one open to the wind. Then, having chosen as his aesthetic north a little island across the bay whose form he particularly liked, he constructed his octagonal house so that from its exact center that island would be visible—framed first by columns, then by further doorway, the paths of the formal garden, and finally by the hand-planted jungle beyond. The result is very rational, and, like most things born of fanaticism, wildly impractical. Since the place had been empty for several years, save for the resident guardian and his wife, a good many replacements had to be made. We had arranged before leaving Morocco to have new mattresses manufactured to fit the enormous beds, and in Colombo we had stocked up on sheets, towels, mosquito-net canopies, kitchenware, kerosene pressure lamps, a new stove and large quantities of food. I remembered that in Weligama the shops carried full lines of flashlights, sarongs, bicycles and firecrackers, but little else. Simple things like vinegar, salt or coffee simply did not exist. The tempo of a sojourn in an unfamiliar place is undeniably slow at the beginning, and you wonder how you will ever become accustomed to the deliberate, leaden passage of the hours. But with each successive day you find an imperceptible increase in speed, until you cease eventually to be aware of time passing at all. We settled into a life which was strange to us only because there was nothing "to do," nowhere to go, and no one to see. Perhaps it was just as well that our routine was made more difficult by an important error of judgment we committed before we arrived at Taprobane. We had been warned that the two resident servants would not be able to prepare our food, and so on arriving in Colombo we engaged a cook, a man named Fernando who had spent a few years in the galley of a freighter. I should have heeded my initial doubts about carrying an urban Sinhalese to the country, for the friction engendered by this sophisticated outsider proved an insoluble problem. Fernando refused even to enter, much less sleep in, the cavelike servants' quarters, choosing instead to set up an army cot in the library of the main house. Though I was unversed in the rules of Ceylonese master-servant protocol, I should have had sufficient intuition to know that the resident servants would consider it scandalous behavior to permit such a thing. They showed their disapproval very soon. By that time, however, I did not need their innuendoes and grimaces to help me understand that Fernando was a distinct handicap. First of all, he screamed in his sleep. I, who had been looking forward to the luxury of long tropical nights whose only sounds would be the songs of insects and the wash of waves against the rocks, found myself being repeatedly awakened during the dark hours by hair-raising cries. Fernando's sleep was one long nightmare. Nor, to judge by his accounts, could his days have been much pleasanter. According to him not only our own servants but all the people on the south coast were dangerous thieves and cutthroats. Fights ensued at the market when he went to buy food, and the police came to complain. The only solution, they told us, was to get a cook from the region. It proved simple enough to get rid of Fernando, but it was not so easy to find another cook. Nobody seemed to like the idea of being on an island, even one separated from the shore by only a hundred yards. Eventually friends took pity on us and bestirred themselves to find us another cook. This one, an inhabitant of the region, insisted on bringing his son along as assistant. We now had six servants, including the lavatory coolie. The screaming of the crows from the bo tree opposite the island is the alarm clock which wakens Gunadasa and prompts him to rise and make our bed tea. Each day he appears from behind the screen, chanting: "Good-morning-Master-tea-Master." Fortified with two or three cups of strong Tangana tea and a few slices of fresh white pineapple, I make my regular early-morning tour of the island, usually coming to rest on a stone bench that commands a fine view of Weligama Bay. The sun, although scarcely risen above the headlands to the east, already is giving off an intimate, powerful heat, and the distant flotilla of fishing boats slips past the white line of the reefs into the open sea, their unfurled sails like the dorsal fins of giant sharks. Scores of timorous black crabs creep out of their crevices in the rocks and sidle toward me. A sharp pain rouses me from my meditations. Big red ants make their nests in the trees that arch high above the bench, and their bite is like a minor wasp sting. I rise quickly and go up to the house, where I work until breakfast is ready. The remainder of the morning is devoted to settling servants' disputes, keeping the marketing accounts, and jumping into the sea when the breeze suddenly dies and the air becomes like a hot damp cloth pressed against the skin. After the lunch of curry, different each day but always so hot it draws tears (a phenomenon I have grown, for some strange reason, to enjoy), there is the afternoon nap, a quick descent into oblivion while the wind, then usually at its height, ripples the mosquito nets and fills the air with the salt mist of breaking waves. It is usually dark before the drums of the devil dancers begin. They do not drum every night; if they did, we should not get much sleep, for once they start they continue until the following noon. Not that they are so loud, but it is hard to stay home when you know what is going on. These ancient, pre-Buddhist ceremonies were once of prime importance to the community, and although they have degenerated over the centuries into what is widely despised as a vestige of primitive "superstition," a really good dancer can still revive the old gods and bring shivers to the watcher. Often we start out at night in our bathing suits, change on the opposite shore into our clothing which the servants have carried across on their heads, and go toward the drums. Sometimes the dances are held in a village home or in the market (we are always urged to enter the crowd, given ringside seats, cigarettes and soft drinks), but the most impressive rites take place in the palm forest, not far from the beach. Here in the dark, the howling masked figures leaping with their flaming torches among the trees achieve their full dramatic effect. Nominally a devil dance is a magical observance whose aim is to banish the demons of pain, psychosis and bad luck by inducing such terror in the subject that he will automatically expel them—a rudimentary shock treatment. It is astonishing to discover how few Ceylonese have watched one of these performances, and how completely uninformed (and, alas, militantly so) most of them are about their own folklore. Among our domestics at Taprobane, the Christians are disapproving and the Buddhists mildly amused; they all prefer to spend the night fishing off the rocks for lobsters and crabs. A good many of the citizens of Weligama (and not a few from Colombo) have come across to the island and paid us courtesy calls. A doctor and his wife arrived one hot afternoon, very formally attired, and caught us lolling on the floor in bathing suits. Their principal interest lay in discovering why we had not yet begun attending the local Church of England. Another day the entire staff of the post office came to pay its respects. Various politicians and lawyers, the chief of police, the owners of several large rubber estates in the vicinity, reporters and photographers, and simple sightseers, all appeared unexpectedly, and all had to be entertained. One day eight young Buddhist monks came bearing a large clay figurine as a gift for the house; another day it was a delegation of Moslems who invited us to the mainland for dinner. When we hesitated, they explained that the banquet was already prepared in our honor, the food waiting to be served; obviously there was nothing to do but go. And what a banquet! 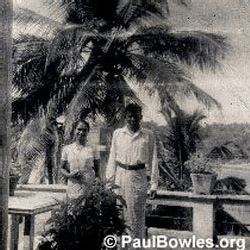 Paul Bowles on Taprobane island in 1955, which at the time had no electricity. Here Bowles wrote the final chapters of his novel The Spider's House. Although I should have appreciated more privacy during the first few months, because of my work, I was impressed by the people of the region, who showed an astonishing and disinterested friendliness such as you practically never find when you first settle in a foreign land. For a while I chained and padlocked the entrance gate at the landing jetty, but the keys were always getting misplaced and we kept finding ourselves imprisoned on the island. Then I put up large, carefully lettered signs in Roman, Sinhalese, Tamil and Arabic script, announcing that admission to the domain was only by previously granted permission. This was a patent absurdity; the visitors hallooed and pounded until the gardener went down and, after arriving at some sort of financial understanding whose details were scrupulously kept from me, took them on a tour which included everything but entry into the house itself. Perhaps owing to language difficulties, it took me about three months to convince my gardener that the extra revenue he got from tourists was not one of his inalienable rights. One visitor who had brought a delegation of school-teachers from Colombo said to me: "This gardener is proud to be the custodian of a national monument, and you, sir, are a very lucky man to be living here." That was a truly enlightening remark; I began to feel not only lucky but apprehensive. It is not a reassuring experience to be told by a citizen of a new and intensely nationalistic country that your home is a part of the national heritage. However, I tried to look pleased, and agreed with him. In a densely populated, prosperous nation like Ceylon, motorists must have somewhere to go; it is a small country most of whose high points of interest lie well off the main highways, and Taprobane is listed in the guidebooks as easily accessible. Nevertheless, I was a little taken aback when I discovered that tourists arrived from as far away as Bombay. I mentioned this fact to an American lady who was spending a fortnight with us. (She had come to Asia, she confided, partly in the hope of meeting a real live maharaja; her other interest was finding Lhasa terriers in the Himalayas.) One day while we were sitting at lunch, the gardener and his wife appeared, in a state of some disarray, to say that they had just had an altercation with a party of eight Indians down at the gate; the struggle had culminated in their pushing the one gentleman down the steps in such a way that he had knocked over two of ladies and a little girl. We expressed polite concern, thanked them, and went on with our lunch. A little later the gardener returned and produced from his sarong a piece of paper. "From Indian master," he said. "Giving paper before fight." I read it and handed it to my guest. Her cries were heart-rending. The gentleman requested my kind permission to allow his entourage to walk about the premises, and the note was signed "The Maharaja of Bhand." Ceylonese law stipulates that any alien who remains in the country, a day longer than the six tax-free months which are allowed him during the year will be subject to full taxation on his world income for that year. (The rates are high.) This automatically excludes the possibility of my living permanently at Taprobane. Early one morning a parade of men advances through the waves from the island toward the shore, each with a valise on his head; bullock carts are waiting at the rest house to pull the luggage to the station, and the last pilgrimage of the season into Weligama gets under way along the narrow road past the Buddhist temple with its clean-swept vihara, past the ayurvedic pharmacy, the mango tree where the chained spider monkey capers. Abd el Azeez's Wireless and Photographic Emporium, and all the other familiar, touching landmarks. As each one moves past, I look at it hard and ask myself: "Is this the last time? Or shall I see them all again?" Nowadays it seems wiser to take nothing for granted. This travel article by Paul Bowles was originally published in the March 1957 issue of Holiday magazine. Read a related travel article by Paul Bowles entitled "An Island of My Own", written in 1985.